Carlotta Wig .. Henna Red .. GORGEOUS! Carlotta Wig .. Henna Red .. GORGEOUS! 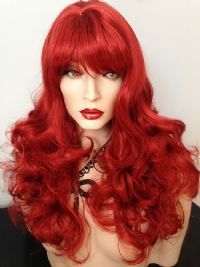 Carlotta Wig .. Henna Red .. GORGEOUS! All my wigs are brand new with tags and have care instructions included. Don't let my cheap prices fool you .. These are the same TOP QUALITY WIGS that many other people are selling for lots more money! Why pay more? Please click on the pictures to enlarge them so you can see how FABULOUS this is! All my wigs fit the average head size, but will adjust to fit a larger head as well. They all have Care Instructions printed on the tags. Gorgeous New TOP QUALITY Wig from the Natural Collection. This is called Carlotta. This is fabulous! It has a Skin Top center part, and is layered and curly with bangs. Total length is about 26" from top to tip. This looks and feels like human hair so soft and silky, but is actually synthetic fiber ... very easy to care for. This listing is for a HOT color called HENNA RED .. ... Note: I usually have this in stock and ready to ship, But they sell FAST at my great price. If I am temporarily out of stock I will usually have more within 2 weeks.